Teriyaki sauce is a delicious, slightly sweet Japanese sauce made with soy that goes great with many types of meat and seafood. Salmon is popularly used in Japan, but you can use chicken or even vegetables for a tasty, easy to make dish. 1. To make the teriyaki sauce, mix the soy sauce and the mirin together in a saucepan. 2. Add a tablespoon of sugar and some grated ginger to the mix and slowly bring to the boil. 3. Simmer the sauce gently on a low heat until it becomes thick and syrupy. 4. In a separate pan, start cooking the salmon until it is nearly cooked. 5. You can now add the teriyaki sauce to the pan and marinate the salmon in it while it finishes cooking. 6. 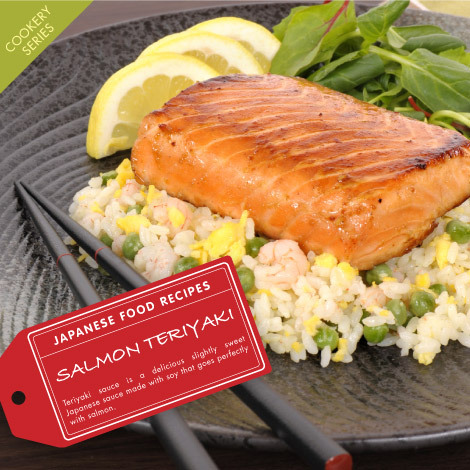 Serve the salmon with some chopped spring onions and a side portion of rice and vegetables for a great Japanese meal. Teriyaki sauce is very easy to make and it also means that you modify the ingredients to suit your tastes. However, if you are short of time you can simply buy readymade teriyaki sauce if you prefer. Posted in Food and tagged recipe, salmon. Bookmark the permalink.